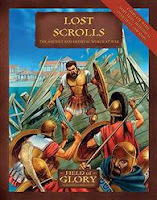 The new Field of Glory supplement, Lost Scrolls, was given to me, and it's up for grabs. Although I love ancients, I am not a very active wargamer. The local gaming club in Denver is fond of de Bellum Antiquitatis (DBA) and Big Battle DBA. So, Field of Glory has been well received at this group. I moved kind of far away, so now I don't know anyone to give it to. I thought it wold be cool to give it away here. Would you like it? Just leave a comment on this post. Announce this give-away on your blog and get a double entry. I'll stop taking entries on On Friday February 5th, at 7pm Mountain Time. I'll then announce the randomly-picked winner in this post's comments. Check back here to see if it's you. 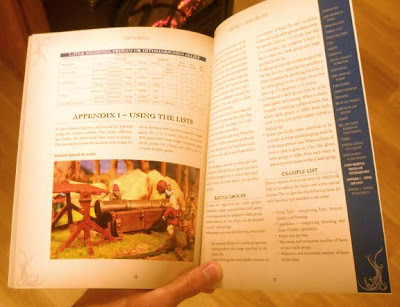 As with the other FOW rulebooks, Lost Scrolls features numerous illustrations from Osprey's catalogue and photos of various painted 25/28mm miniatures. The model photos are mostly single minis placed decoratively. There are no full-page tabletop wargame scenes, but there are a couple zoomed-in diorama vignettes. A lot of these photos have that tungsten bulb yellow cast, but overall they're nice. Published by Osprey, this paperback's production quality is, of course, top-notch. The paper stock and print quality are high quality. Text layout and charts make for easy reading and quick reference. If you own the main FOW rulebook, you should definitely be happy with this last of the supplements. I'd love a shot at the book. I haave been wanting to give FoG a try and this looks like a good book to look over for a good cross section of possible army lists. I'll give it a push on I See Lead People for you too. I too would like a chance to win this supplement to dive into new periods for FoG. Thanks. I wouldn't mind a shot at that supplement as well. I'm just starting to learn FoG (and FOW). Very kind of you to give this away. You may count me in as well. I put in a plug for you on my blog, moosetracks2009. I am just starting out in Field of Glory and this would certainly help with the army building. I'd be interested to see what they've done with the various early Italian classical lists. Happy to put my name up for this as well. Perhaps you should have a prize draw! Yep include me as I love FOG. I'll give you a comment on ACG as well. count me in this could kick me back in to fog. Nice of you to make the offer on TMP. You have quite a blog! Thanks for the compliments, guys. Hey, Anonymous. If you want to be part of the running, you should add you name to your comment. Very cool, I would love to win + read this! This will definately be a welcome expansion to my FOG collection (especially if it's free)! just want it to be known that I did post twice, above, so I should only be entered once. Congrats, Ken. I did the drawing, and you get the book. Email me your address, and I'll send it in the mail. email sent to your RedRampant address. Thank you very much.